Your best furry friend deserves to adorn everything from the shirt on your back to the plate on your table. And while there are plenty of places to get T-shirts with your dog’s likeness printed on them, you can bet there aren’t many options when it comes to having your pup’s face emblazoned on a dinner plate. If pet-patterned ceramics suit your decor, then Bay Area-based artist Alexandra Thurston is your gal. 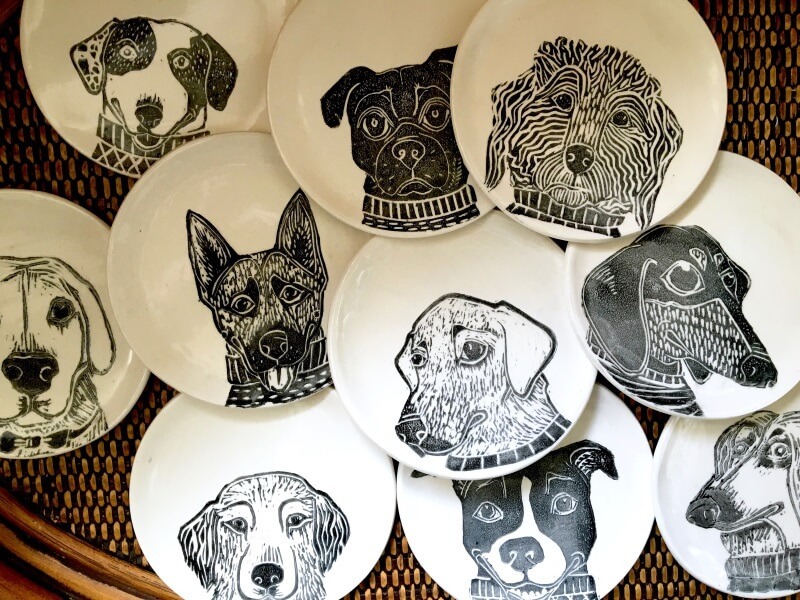 She uses linocut tools to create custom stamps based on pet photos, and then she transfers the image to a porcelain clay plate before giving it a final glaze. The inspiration came from Thurston’s obsession with animals, having grown up with a beautiful liver-spotted Dalmatian named Truffles who was considered her sister. In college, the young artist – who has been working with polymer clay since she was just 6 years old – made a print series of animals dressed in formal human clothing and then recreated them as plate stamps. Soon, people were asking her for custom work. Today, Thurston offers her designs via alexandrathurston.com. She does custom projects – everything from round or square dinner plates to bowls and coaster sets – for $70 a piece and will add your pet’s name for no additional charge. A portion of proceeds are donated to the ASPCA, and Thurston has worked with local dog adoption agencies such as Hopalong. Expect to wait about six to eight weeks for the work, but rest assured it’s all microwave and dishwasher safe – and utterly adorable.